Alaska is not just what we do for a living, it’s our ancestral home, our life’s passion, and our legacy. We’re not your everyday cruise line. We’re Alaskan through and through, from our casual jeans-and-sweaters atmosphere to the warm frontier hospitality of our Tlingit-Alaska Native birthright. We’re 100% focused on safety, chef inspired cuisine, complimentary beer and wine is served at dinner, friendly Alaskan service, comfortable accommodations, and making sure that we squeeze every drop of wonderment out of Southeast Alaska. We pioneered Alaska day boat tours and after 40 years of exploring the Inside Passage we’re uniquely positioned to inaugurate overnight cruises aboard our own yacht-like vessels. Their shallow draft and nimble maneuverability make it possible to offer up-close glacier viewing and to seek out the best opportunities to mingle with and photograph wildlife. And our ships’ intimate atmosphere fosters strong bonds of friendship, many of which endure and bring you back again and again. Get away, far, far away. We’re passionate about the kind of wilderness that is increasingly rare outside of our home state. But we also know that there are certain marquee attractions no Alaska visitor should miss—like Glacier Bay National Park. 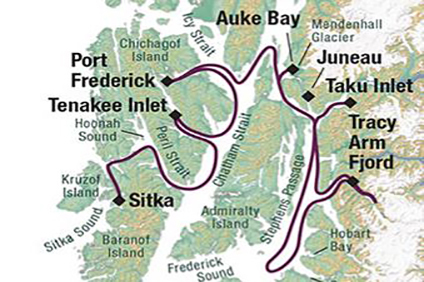 Our itineraries combine renowned natural wonders with places off the beaten track and cruise roundtrip from Sitka to make every adventure complete. 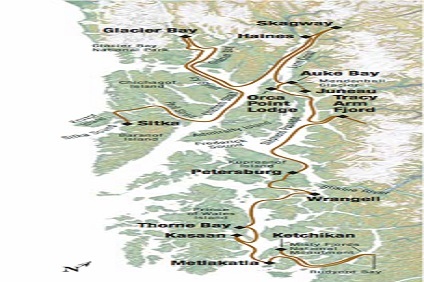 Enjoy at least one and sometimes two intriguing Complimentary Shore Excursions in each port of call that showcase true Alaskan adventure and colorful native heritage. And these extraordinary experiences are included at no extra cost for incomparable vacation value! 8 Night Cruise sailing from Sitka to Ketchikan aboard Alaskan Dream. 7 Night Cruise sailing from Sitka to Juneau aboard Misty Fjord. 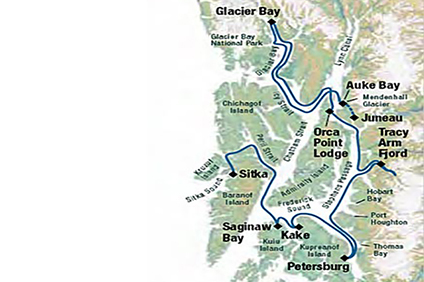 7 Night Cruise sailing from Sitka to Juneau aboard Chichagof Dream. 8 Night Cruise sailing from Ketchikan to Sitka aboard Alaskan Dream. 7 Night Cruise sailing from Juneau to Sitka aboard Misty Fjord. 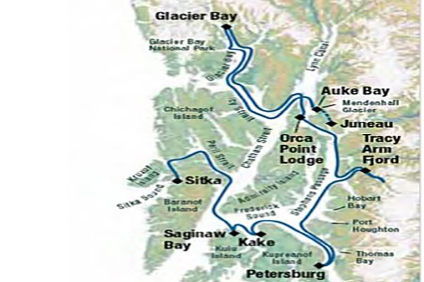 7 Night Cruise sailing from Juneau to Sitka aboard Chichagof Dream. 10 Night Cruise sailing from Sitka to Ketchikan aboard Alaskan Dream. 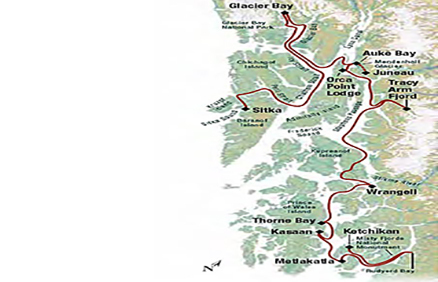 10 Night Cruise sailing from Ketchikan to Sitka aboard Alaskan Dream. The Alaskan Dream Cruises team of professionally trained chefs takes great pride in presenting outstanding, well prepared meal selections featuring fresh, organic, and locally produced food. With Chef Inspired Gourmet Cuisine, menus change daily offering several selections from a menu usually including a seafood or meat entrée. Fresh, locally caught Alaskan seafood is a specialty of Alaskan Dream Cruises. Early or late risers or light eaters can enjoy a continental breakfast buffet in dining rooms from 6:00 to 9:00 AM. Meal times vary depending on the day’s activity schedule; breakfast from 7:00 to 8:00 AM, lunch at noon, and dinner from 6:30 to 8:00 PM. The Dining Room table configuration allows easy conversation and seating is never assigned so guests can choose different meal companions at each meal. Aboard ship, a nightly social hour and re-cap an hour prior to dinner featuring delicious freshly prepared hors d‘eouvres and cocktails presented in our forward viewing lounges. This provides the perfect ending to the day with your Expedition Leader re-capping activities and previewing the next day. Coffee, tea, hot chocolate are available at all times in both the Dining Room and forward viewing lounges. Special diets or meal requests can be accommodated in most cases. If you require a special diet or have allergies to certain foods be sure to note those on the Dietary Preference Form so we may accommodate your needs. It is important to give some advance notice of special diet needs so appropriate food can be on board. A selection of fine alcoholic beverages, beer, and wine are available aboard ship for independent purchase, but not included in your cruise fare. There is a good selection of wine available aboard, and you may purchase a bottle and have the unfinished portion capped and held for you. Complimentary beer and wine is served at dinner. Discretionary gratuities to the crew are welcomed.